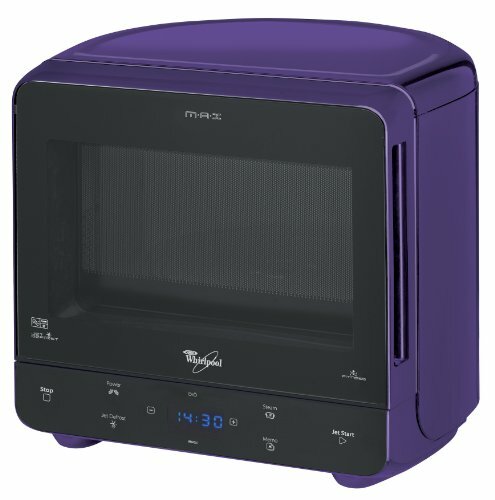 The Whirlpool Max 35 Purple has two main selling points - the funky purple colour scheme and the quirky curved back panel, which enables you to easily fit this 13 litre 750w microwave into the kitchen corner. Quirky purple colour scheme, fits handily into a corner, without taking up too much kitchen surface. The slightly unusual design with the curved back may not appeal to all. If you're looking to buy a purple microwave, then aren't too much options on the market. This model from Whirlpool offers a decent capacity with it's 28cm turntable, yet only takes up a fraction of the space than a normal microwave, thanks to it's rounded back design. This quirky curved design of the purple Max 35 means it looks best when pushed into a corner - it wastes hardly any space, yet despite it's tiny dimensions offers a substantial 750w of power, a steam cooking mode, defrost mode, and a whole host of features. The clearly marked controls are situated at the base of the microwave's door. The steam mode is a welcome addition, which is rarely found in microwaves - providing you with the option of cooking food via steam instead of just microwaving. The inside is easy to wipe clean, and overall build quality seems to be pretty sturdy - no complaints here. In our experience Whirlpool produce reliable appliances, and with the Max 35 we have had no reason to question that reputation. To conclude the Max 35 Purple from Whirlpool is a decent shout if you're looking for a reliable solo microwave, performing well and being easy to clean. The Whirlpool Max 35 is available in a variety of colours, including Silver Whirlpool Max 35, Purple Whirlpool Max 35, Orange Whirlpool Max 35, White Whirlpool Max 35, Red Whirlpool Max 35, Cream Whirlpool Max 35, Green Whirlpool Max 35 and Black Whirlpool Max 35.